Our goals are to preserve the heritage of the areas lying in the shadow of Vesuvius and to bring a greater awareness of its cultural wealth to the academic community and to the wider public. 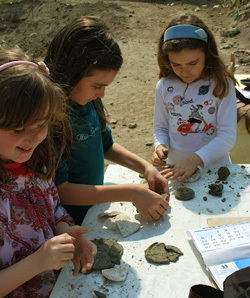 We see our students as our partners in that venture - as aspiring archaeologists and heritage professionals. We are a non-profit, self-funded project, which means that most of our funding comes from student participation, donations, and supplies and support from the people and institutions where we operate. We charge minimal student fees with the goal of making participation feasible for all qualified applicants. We are, however, ambitious in terms of our standards for the restoration of the site, our research aims, and the overall quality of our excavation. The balance of keeping costs affordable but standards high is a difficult one to achieve, but one to which we are strongly committed. Student contributions are not enough to maintain that balance. We also rely heavily on the generosity of members of the public and heritage enthusiasts to help us meet these expenditures. Every extra bit of support directly benefits the students, the excavation, and the local population, with whom we work closely. If you would like to work with us to further our research goals, we would appreciate your donation, no matter how small or large. When you donate, we would like to encourage you to specify how you would like your gift used. Donations, for example, can be used for the refurbishment of our archaeological laboratory or for scholarships for student participation. For 1000 Euros, we can create a scholarship in your name, either for one season or recurring year-to-year. These are just two examples of ways that you can help bring the heritage of the Vesuvius region to the forefront and to support the people dedicated to preserving it. In 2010 we discovered two Late Antique infant burials in close proximity. The children were encased in amphorae (large storage jars), a common method of child burial. In antiquity, the infant mortality rate was high, and these burials are poignant proof of that. Based on the relative size of the skeletons, their osteological characteristics, and burial location it is possible that these children were twins. We aim to test this hypothesis through DNA analysis. We have collected DNA from the remains, but the DNA testing itself is 3,000 Euros. Stories of twins in antiquity are well known - Romulus and Remus are the most famous twins in history. Nevertheless, no one has ever carried out DNA analyses on possible ancient twins. This would be the first time that this test would be performed on Roman remains. We also hope to learn more about the children’s ethnic group. At the time of their burial, in the mid-5th c. AD in Campania, there were many different ethnic groups: Italic descendants of the Oscans and Roman colonists, but also many people from the Near East and Africa, mostly slaves and freedmen, as well as raiding barbarians from northern Europe. Finally, we hope to determine whether their deaths were caused by any sort of genetic disease. Our second featured project relates to our excavation of a medieval churchyard at Roccarainola. There we found the remains of at least 51 individuals. We aim to raise funds to allow us to radiocarbon date the bones, so that we can learn more about the community of Roccarainola. The cost for such testing is approximately 300 Euros for each test, and we aim to analyse at least three remains. Our third project concerns outreach and development. Currently we have a small museum space in Pollena Trocchia where we display some of the finds from multiple sites associated with the Apolline Project. We are developing the museum gradually. Our current goal is to raise funds for two or three panels for the museum, each about 150 Euros. Eventually, however, we would like to undertake a much larger redevelopment, with a cost of approximately 10,000 Euros, wherein we will purchase more display cases, better lighting, and more panels. Finally, restoration work for many of the structural elements at the Roman baths in Pollena Trocchia is critical. We recently gathered funds for the repair of one of the main vaults. Work on the vault will begin this month. Much more remains to be done, however. At least three more vaults need stabilisation and restoration. Once this restoration is complete, the site can be opened more frequently to the public and our goal of incorporating it as part of a larger archaeological park can be realised. If you donate to a particular cause, we will keep you updated as to the results of the project. We will also feature the results on our website, in academic publications, and on our social media pages. To send an email requesting more information, write to: info@apollineproject.org, or to donate now, simply click the 'Donate' button below.